The old WIP thread is below. This tutorial is a work in progress, and I’ll be editing these posts as I add to the tutorial, correct mistakes, and make changes in the structure and syntax. For now the tutorial will reside in this post and the three below it, and each time I change a section, I’ll update the last-edited date and version number on a line at the bottom of that post. Once the tutorial is more or less complete, I’ll remove this pre-introduction and post the finished tutorial to a new thread and/or make and distribute a pdf. At that point, I’ll let this WIP thread fade into obscurity. If you are here looking for help with hair, please keep in mind all of the above and take this advice with a grain of salt, but I hope you do find some useful information here. Feel free to respond and let me know what worked and what didn’t. You don't need to own these same hair products to use the tutorial, though: you can follow the examples using any hair of the same type (keeping in mind that some of the finer details might be different). The principles described in the tutorial should apply to just about any hair. A few weeks before beginning to write this tutorial, I posted a message in the New User forum, asking if anyone knew of a good tutorial or general advice on hair. While I got a great deal of helpful advice, I didn’t find any tutorials, so I decided to write my own, compiling the responses to my question together with other information I’ve learned about hair. In this endeavor I’m greatly indebted to those individuals--including (in no particular order) fixmypcmike, Jaderail, adamr001, Frank0314, DWG, Indigone, Wiseavatar, RAMWolff, Lindsey, kitakoredaz, and others--who have helped me and other forumites with hair-related questions. I’ve provided links to several of these threads in the Additional Resources section at the end of the tutorial. With some exceptions--short hair just needs to attach to the head and is likely to be a prop, while long hair also needs to respect the rest of the body and is likely to be conforming (so that you don’t have long tresses sinking into the shoulders, for example). Conforming hair is analogous to conforming clothing--at least in theory, it can conform to the body without causing pokethrough or other issues. Regardless of whether the hair you are using is a prop or a figure, it probably falls into one of two categories: transparency mapped (transmapped) or fibermesh. More rarely, you may encounter some hair that’s neither; these will likely be highly stylized rather than realistic (Nata Toon Hair is one example). Think of transmapped hair as a series of ribbons attached to a skullcap. The ribbons are textured to look like locks of hair, with transparent stripes and sections for the gaps between hair strands. The last promo image of Pure Hair: Catwalk gives a good illustration of how these ribbons look without the textures and transmaps. Fibermesh hair is more like real hair, with each strand (fiber) represented--although the fibers tend to be somewhat thicker and not as dense as real hair. Fibermesh hair usually has a very high polygon count, so it’s memory-intensive. 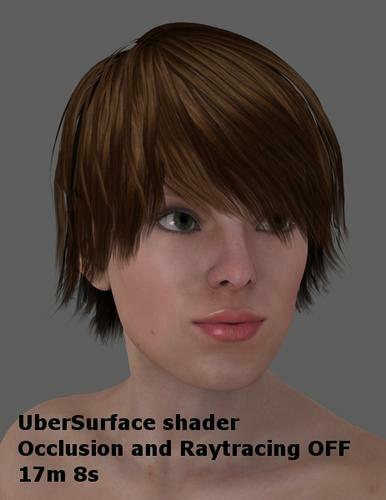 Transmapped hair can also take a very long time to render, due to the transparency maps. Later in the tutorial, I’ll discuss strategies for rendering hair more efficiently. 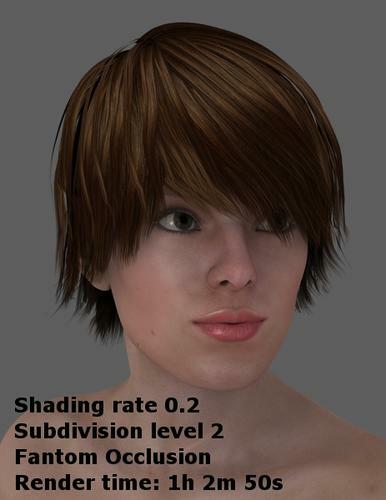 Figure 1.0 (above) shows, from left to right, fibermesh hair, transmapped hair, and a geometry-based hair without transmaps. It was rendered in DS4.5 with basic, non-Uber lights. The character is Candace for S5 mixed with Young Teen Julie. Two new hair plugins for DAZ Studio offer additional options for realistic hair: Look At My Hair (now available in the DAZ shop) and Garibaldi Express (in beta, as of this writing). You can find out more information about these from their official sites, forum threads (LAMH | Garibaldi), and other sources, but the bottom line is either plug-in offers users the ability to create, grow, and shape their own fiber-based hairstyles. I haven’t used either, but I have admired the results I’ve seen from other users. These aren’t truly dynamic (the hair doesn’t behave dynamically in DAZ Studio) but within the plugin it works much like dynamic hair--it can be combed, cut, grown, etc. When the hair you want to use is compatible with the figure you want to use it on, the procedure is usually very straightforward. There are several ways to fit the hair to your character’s head, and they correspond with the methods for loading clothing or accessories. 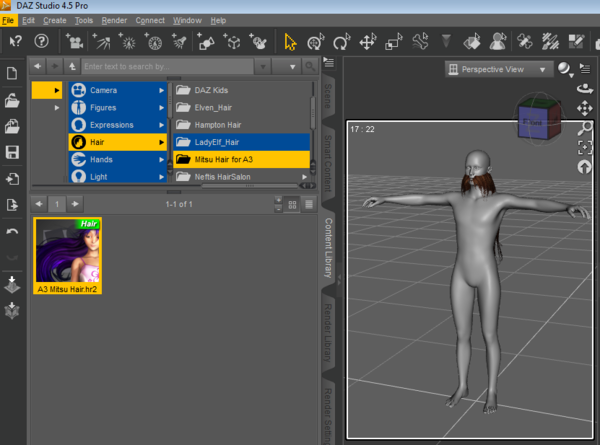 With your figure selected (the whole figure or just the head), double-click on the appropriate hair icon from Smart Content or the Content Library, or right-click the hair and choose “Load it.” You can also click and drag the hair icon onto your figure (and the figure doesn’t need to be selected in advance for this method to work). Another option is to load the hair separately by double-clicking it without the figure selected, then right-click on the hair once it loads, and choose the option to fit it to the figure (for example, “Fit ‘WildMane Hair’ to...”). Sometimes this is all you’ll have to do; other times, if the hair loads untextured, or the fit isn’t quite right, or if you want to color or style the hair in a certain way--there will be additional steps. These will depend on the situation, but they are covered in parts IV, V, and VI of the tutorial. With AutoFit, it's nearly as simple to use conforming hair made for 4th Generation figures on Genesis--especially in DAZ Studio 4.5. With your figure selected, double-click on the hair. A dialog box will pop up asking you to select the figure that the hair was made for (if you don't know, consult the readme or the online product description), and the type of object (hair, in this case). The software will do the hard part, leaving the hair conformed to the figure's head. This should work with all Genesis shapes, but it may not work perfectly with the more extreme ones, so keep that in mind if you want a gorilla with braids or a troll with an updo. When the hair you want to use is not compatible with the figure you want to use it on, all is not lost! Virtually any hair figure or prop that DAZ Studio can load can be made to work with the figure of your choice; it just takes a little more effort. 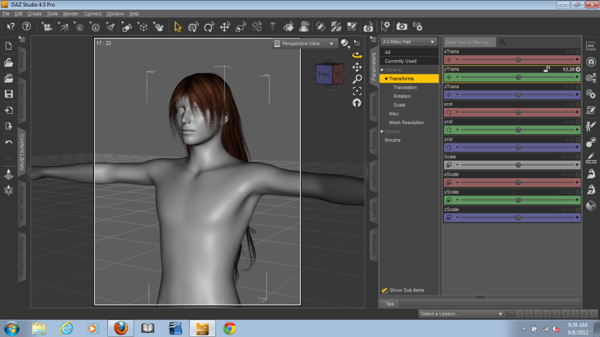 If you’re using Genesis and a hair that was intended for another figure, you can try to AutoFit the hair to the figure. Results vary, and you may lose the ability to use the hair’s built-in morphs if you do this (unless you’re using DAZ Studio 4.5, that is). An alternative way to get your hair onto your figures is to parent it rather than “fitting” it. The difference is that if the software is not able to adequately get the hair to fit to the figure’s head, you can do it manually instead--but you’ll have to tell the software to make sure the hair moves with the figure so that it doesn’t suddenly come off if you change the figure’s pose, position, or shape. The way to do this is called parenting. 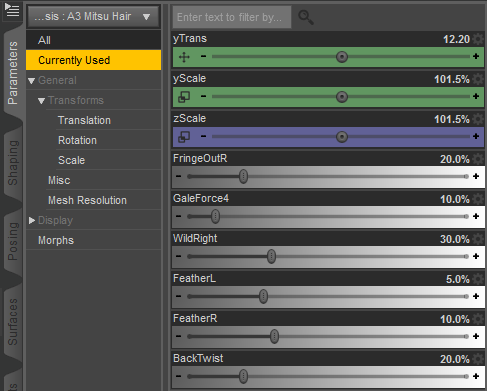 Select the hair and go to the Parameters tab. Zoom in so you can see what’s going on. Adjust the y-position slider until the hair is in the right vertical position. You may need to adjust some other sliders as well--such as scale (or one or more of x-scale, y-scale and z-scale). When it’s looking as close to perfect as you can get it, take a look at any morph fit sliders in the Parameters tab, and/or pose sliders in the Posing tab, to fine-tune the fit. These will depend on the hair that you’re using, but often there are sliders that will let you control how the hair fits specific parts of the head, such as the temples, and perhaps move the hairline. The idea is to align the hair’s skullcap with the figure's head as perfectly as you can--otherwise when you render your scene, you could see something like sideburns that seem to float next to the character’s head, or bangs sprouting from the forehead. If you’re not sure, it may help to do a test render to see how things look. The next section of the tutorial will discuss this procedure in more detail. Finally, you’ll want to parent the hair to the figure. There are a couple of ways to do this. You can go to the Scene tab, click on the hair in the list, and drag it to the figure’s head (you’ll have to expand out Genesis by clicking the triangle next to it in the Scene tab, and the triangles next to each node, until you see the listing for the head). Alternatively, you can right-click the hair in the main viewing pane and select Change Parent. A dialog box will pop up--select your figure’s head from the list (again, you may need to expand out the figure by clicking on the triangles), make sure “Parent in Place” is checked, and click Accept. Note that there may be more than one "Head" node in the list...be careful to choose the one that belongs to the correct figure. Now that your hair is parented, you should be able to move the figure around, or pose it, and the hair will stay on the head! 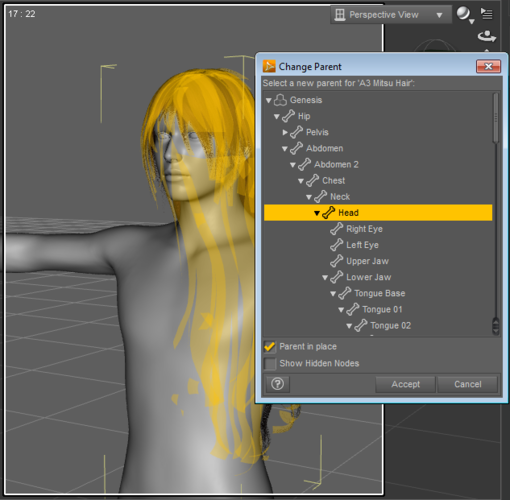 If you change the figure’s shape, the hair should still stay in place, but you may need to adjust the fit again by using those sliders in the Parameters tab, and perhaps the Posing tab. If you go to the Scene tab, you’ll notice that the hair is no longer a separate entry--it now appears nested under the figure’s head in the list. Hair typically comes with one or more color options, and there are a few methods you can use to change the color among these options--or even dye it the color of your choosing. Styling hair is a broad enough topic that it probably could the the subject of a tutorial of its own--especially if one includes procedural hair systems like Look At My Hair and Garibaldi, in which styling options are much greater--and parts of such a tutorial could more easily be written by a professional hairdresser than by your average 3D artist. Rather than going much detail here, I'll simply recommend playing with the various morph dials, colors/materials options, supplied poses (if any), and other settings until you find a style that works well for your character and scene. You may be surprised with the diverse looks you can get out of a single hair model. For example, the three attachments below all feature Gia Hair by AprilYSH. Keep in mind that you can turn limits off if you want to push morphs even further than they would typically go. To do this, click on the little gear by the morph slider, go to "Parameter Settings," and deselect "Use Limits" (or set the range by changing the Min and Max values). Question: Is hr2 hair conforming or prop based? 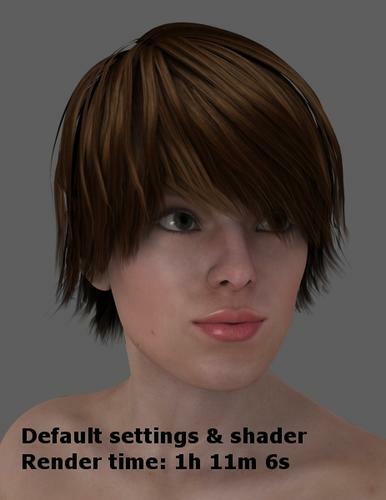 In this thread http://www.daz3d.com/forums/discussion/4180/ (which you reference in your thread) it says hr2 hair is prop hair. Your tutorial says it is conforming, so I'm still confused. This will be a valuable resource when you finish it. Good catch Barbult. I did not catch that one typo in my first read through. hr2's are prop hairs. HR2 is a poser hair format... My sources don't agree on whether it should count as a prop or a figure--but I bet you're right; it's a prop. I'll do more research and update as needed (or if you're sure, I'll skip the research and take your word for it). Thanks for the feedback. Am I correct that .obj hair is also a prop? I think I've seen conflicting information about that, too. I for one have only used cr2, pz2, and hr2 hair's so I'm not up on obj hairs. I do know hr2's can be very versatile but as far as I know they do not auto conform when loaded. IF a hair has an obj and a matching CR2 then it is going to be conforming hair. Hr2 hair is prop hair. I do have some very old hairs that were marleted as props and went in the props folder rather than the hair folder, but it is not done very often that way. Thank you...I have updated the relevant post. Most of the obj hair I've seen has been paired with .cr2 files; Cuffed Tail 2 is an example of one that's .obj and .hr2 (when I look in DS I only see the .hr2, though). I've removed references to .obj hair in the tutorial...perhaps it's not a distinct format after all. 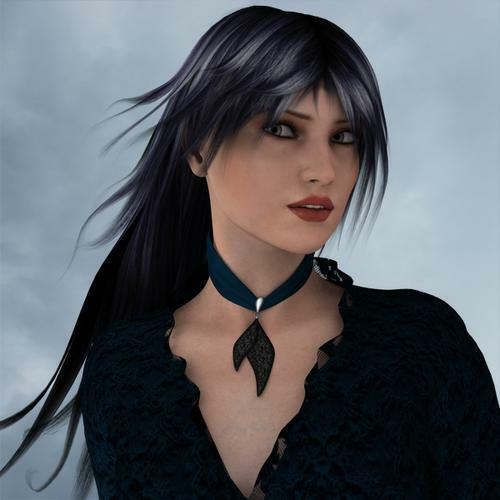 It appears the only .pp2 hair I own is Sonia Hair (which also has a .cr2) format by StudioArtVartanian at Renderosity. It shows up in the Props folder, but I don't think it's all that old (there's even a Genesis fit slider). Thanks for taking on this project. It will be very valuable to all of us. So far, I've managed by stumbling around and if one won't do what I want, I try another and another until I hit one that will. Ah yes you will come across some hair models that include both a conforming and a "Universal" hair prop, which will be in HR2 format. The idea with these ones is that the conforimng hair will fit the character it was designed for, and the HR2 can be fitted to multiple other figures. Great beginning tutorial and explanation! I hope we see more from you on this, Scott! Hey, this is great!!! :) Thanks for sharing it with us! ...also: I actually busted out laughing at "III. Parenting 101: Not Just for Moms and Dads" :lol: Good Stuff! Thanks everyone! I took a little break to focus on other things, but I'm working on this again and you should see a significant update within a week or so. Thank you for creating this tutorial thread, Scott. I just stumbled upon it, and look forward to it's completion. Just for posterity; You stated that you removed .obj hair references from the tut in post #9. I would like to make a correction for your edification. All hair is .obj hair (painted, and dynamics aside; Which may, or may not be as well) in reference to the basic hair you are discussing. HR2, PP2, and CR2 are all format styles which include the .obj (hair mesh model prop) either included in the file itself, or referenced out to a called upon location. OBJ (.obj) hair prop as yet another option is viable, but mostly obscure to the masses. Generally, approximately 95% of end users don't utilize this, because they purchase, or acquire freebies that are already in one of the aforementioned formats with the .obj included. 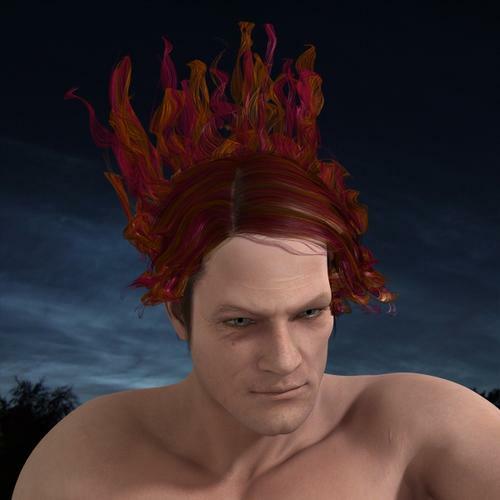 But, for those 5%, like myself, the last .obj hair prop option is directly importing prop (usually modeled by oneself) for use on selected avatar. This is not the norm, and you probably don't need to include it in the tutorial set. I just thought I would mention it, so you could differentiate what some might have been trying to point out regarding all the hair variables. You already covered the differences between conforming, and static hair props. The OBJ hair prop (.obj import) falls under static hair prop. Scott, I learn more from this tutorial every time I reread it. Did you mention that sometimes the hair morphs are in the Neck of the hair? I couldn't find them for awhile. Very nice first example, and sweet render! And I love the nose and skin texture on your char. Any hints what you used? Update 10/2/12: added brief instructions for AutoFitting conforming hair, and linked to other tutorials covering the transfer utility and a method for converting prop hair into a conforming figure. More updates likely within a few days. Thanks for sharing this good read! I apologize for letting this languish for the past two months. To be honest, I had gone about as far as my knowledge and experience would permit me. I'll be updating again soon. I might change the structure a bit, emphasizing simplicity a bit more at the cost of comprehensiveness. As always, any feedback or suggestions would be most appreciated. A great tutorial and easy to follow. With this to refer to I shouldn't go far wrong. Thanks for the kind words, Rogerbee! Just completed Section VIII (Special Topics) with information on hats, elf ears, beards, and body hair. Will post one final update in this thread once all of this has been finished. Then I'll post the polished version of the whole tutorial to a new location (should it be here in the New User forum, or in the DAZ Studio Discussion forum?) and let this WIP thread fade away. But before I call it finished, does anyone have any other hairy questions you'd like me to address, or any other tips to add? 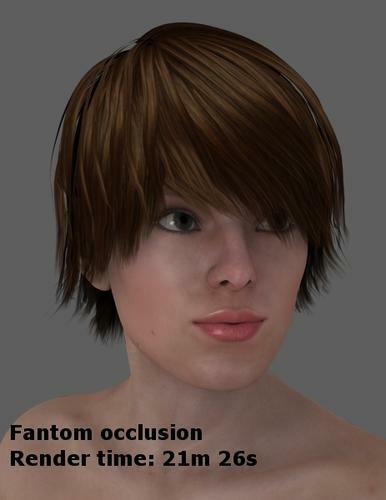 I'm glad someone will finally explain what Fantom is! Made some more additions and edits, and I think I'm ready to call this "done. "* I will reformat this and post it in the "DAZ Studio Discussion" forum within a day or two. Thanks again for all the feedback! *Feel free to prove me wrong by pointing out any corrections or unanswered questions! Cool, it'll be worth a read.